Hey, Performance Golfers, Matt Walter here. 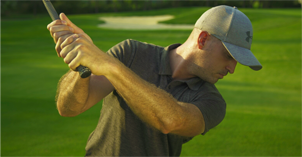 We’re going to get you squared away with a great drill and learn how to shallow the golf club using the right trail arm, trail side action in your downswing. 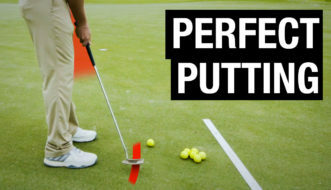 This drill is here to help you learn how to get the golf club slotted in a manner that is effective, and also efficient in delivering the golf club. What we’re trying to do here is learn how our torso, so pretty much, just think of your rib cage, moves in the downswing, and how our right arm can move in the downswing so that you can kind of get rid of that slice or get rid of that quick snap hook flip. A lot of times, what I see golfers doing in their downswing is that they are producing this motion where their upper body leans too far forward, and their right arm works away from their body, giving us a gap between their right arm and their rib cage, and you get to see this nice flexed right hand, which we all know looks like a great little flip. You’ll see them tilt, you’ll see the club go this way, that right arm’s off the body, and then you’re just hitting and hoping, and you’re praying to the golf gods for a good bounce. So, what we’re going to do is learn how that rib cage can move in the downswing and how that trail arm can maybe change just a little bit so that we can deliver the golf club with a little bit more of a shallower, slotted position. 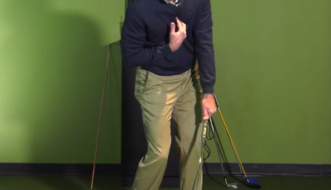 This is a great drill, I think, for most of you golfers over there who struggle with the over-the-top move or you’ve got the inevitable flip at the bottom of your golf swing, because if you watch what the tour players are doing online, in a YouTube video or wherever, you’ll see the tour player, their head actually moves back a little bit in the downswing.